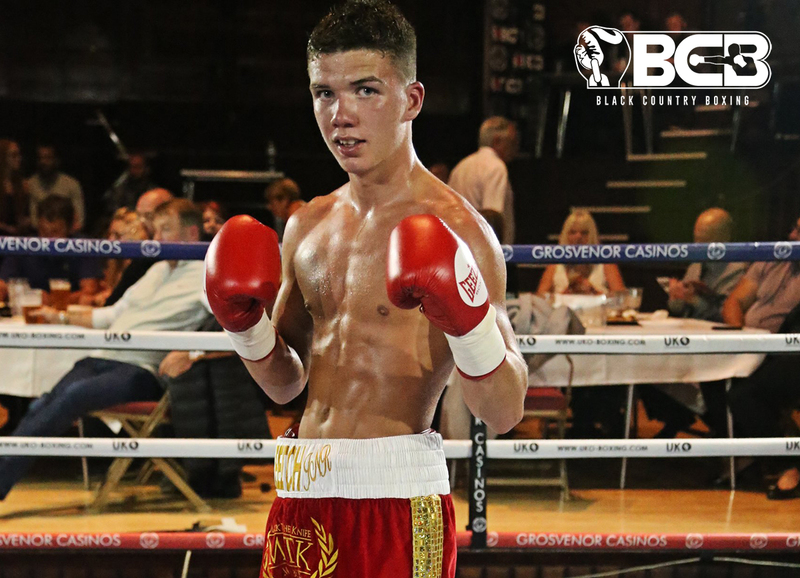 Bloxwich’s James Beech Jnr will be looking to put on a five-star show when he signs off for 2017 on BCB Promotions’ show at the Imperial Banqueting Suite on Lichfield Street in Bilston, Wolverhampton, on Saturday, 25th November. Beech has already racked up four pro wins with one TKO over a stellar debut year and has already stepped up in distance. He’ll remain over six when he steps back through the ropes later this month. Beech, who is signed to the MTK Birmingham stable headed by former British and European champion Matthew Macklin, will be hoping to pick up where he left off last time out. His first pro career stoppage came last time out as he dispatched of Russell Midgley in three rounds having scored a knockdown on the way. It was the first early finish for the 20-year-old featherweight since his days as an amateur for Pleck Boxing Club, who he boxed for on 80 occasions with 50 wins. The second-generation fighter is the son of Jimmy Beech, who laced on the gloves for 31 pro outings at lightweight between 1999 and 2008. He’s coached by Peter Hickenbottom. James has enjoyed living the life of a paid pugilist since turning over in February and wants to be fast-tracked towards titles next year. “Me and Pete agreed we wanted four wins by the end of 2017,” he told bcb-promotions.com. “We’re already there so we thought we may as well get a fifth one in. “This is the most active I’ve been as a boxer since I was 15, I think I’ve had a total of four weeks out of the gym all year and two of those I went on holiday, one after the other. “Me, my dad and the rest of the family are going away to Tenerife for Christmas and New Year, which I’m looking forward to but I hated feeling bloated when I came back from my break in the summer, so I’ll be doing bits and bobs when I’m over there. “I know a gym over there I can use, where I can go on the punch bag and pads and, of course, I can go out for a run whenever I want. My dad will be nagging me to do something! Beech is hoping to take on Ricky Starkey next, who has been mooted as an opponent since the two were matched for his second pro bout. Scouser Starkey is a game ex-Marine who has been dubbed ‘the Batallon Stallion’ and the 31-year-old has three wins and two draws from seven outings, with both losses by TKO. “Starkey comes to win fight and wants to win,” explained Beech. “That’s why I want to him, I’m looking for a step up and I believe that what he is. “He’s like a little stepping stone for me and he’s not a bad fighter at all, so me and him is something I can really get up for. “We’ve asked the question whether he’s available to fight me on November 25th so, hopefully, it can happen. Beech supports the main event for the vacant Midlands light heavyweight title, which will be contested between Tipton’s Ricky Summers and Coventry’s Joe Sherriff. Black Country boys Jason Welborn and debutant Antony Woolery also feature on the under-card, along with Stoke’s Nathan Heaney. Rowley Regis’ Welborn has held WBC International Silver and Midlands honours in two divisions and challenged for the British title twice. Woolery will campaign at cruiserweight as he enters the pro ranks, coming down from heavyweight as an amateur whilst Stoke’s Heaney debuts at middleweight. Tickets are on sale now, by contacting the boxers on Facebook or online at iboxingtickets.com. They are priced at £35 standard with all £60 ringside now sold out. It will be £40 entry on the door come fight night. Grosvenor Casino Walsall will sponsor the show and host the weigh in and after-show party (over 18’s).